You may have heard the term “slipped disc” used to describe a low back injury. Discs do not actually slip. Rather, they may herniate or bulge out from between the bones. A disc bulge is a displaced fragment of the centre ‘jelly-like’ part of the disc that is pushed through a tear in the outer layer of the disc. Pain results when irritating substances are released from this tear, or if the fragment pinches a nerve. 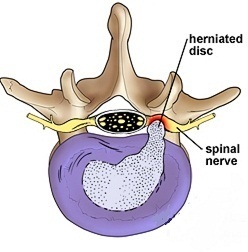 A disc herniation has some similarities to degenerative disc disease and discs that herniate are often in an early stage of degeneration. Herniated or bulging discs are common in the neck or low back. Many factors decrease the strength of the disc and increase the risk of disc herniation. Life style choices such as smoking, lack of regular exercise, and inadequate nutrition contribute to poor disc health. Poor posture, daily wear and tear, injury or trauma, and incorrect lifting or twisting further stress the disc. If the disc is already weakened, it may herniate with a single movement or strain such as coughing or bending to pick up a pencil. How do I know if I have a Disc Bulge? Bulging discs are most likely to affect people between the ages of 30 and 40. Disc bulges may be present without causing pain, however, the most common symptom will be pain in the area of the bulge that may radiate across the hips or into the buttocks. You may also experience numbness or pain radiating down your leg to the ankle or foot. If the herdisc bulge is large enough, you may notice that you may be unable to walk on your toes or heels. In severe cases of lumbar disc bulge, you may experience changes in your bowel or bladder function and may have difficulty with sexual function. A mild to moderate disc bulge can usually be treated conservatively with stretching, exercise therapy and Chiropractic mobilisations. More advanced cases will often require some form of spinal decompression, in conjunction with chiropractic care. Occasionally, a disc bulge may be severe enough to warrant surgical intervention. These cases are usually reserved as a last resort when other forms of therapy have failed to relieve pain, or if there is significant compression of the spinal cord or nerves.